I’m a very reluctant resident of Boksburg, I don’t like the town and a disturbing percentage of the general populous have a penchant for vulgarities like fins on their cars, plastic flowers and Cruella de Ville hairstyles. Still in the same breath I must say that I have encountered some beautiful souls in this dirty old town and among those is my children’s music teacher John Skinner who teaches from his home in Parkdene. Fjord goes to violin lessons with him and Acacia is learning to play the keyboard / piano. 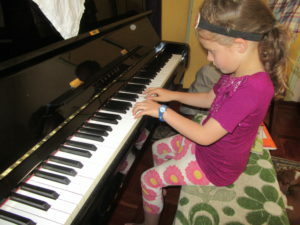 For some time Fjord (10) and Acacia (7) wanted to learn to play musical instruments. Although outwardly encouraging Fjord’s choice I cringed anticipating blackboard nails like torture while enduring violin practice sessions (thankfully this has not been the case). John is the most wonderful teacher that we could wish for, he is gentle and infinitely patient only teaching in a constructive positive way. The children feel comfortable and respond so well to his teaching method. Fjord started lessons in March and Acacia around June (thanks to my friend Abbey who so generously gifted her with a keyboard). I love the rounded musical education which he shares with his students, for instance he will take them to a harp and show them where the musical notes are on the harp strings. Children grow comfortable with public performance when he holds small concerts at his home. Sometimes after a lesson John has played harp for us and we slip into a beautiful world listening to the enchanting instrument. In the video below Fjord played in his first concert at John’s home after about 6 months of lessons. Soon after Acacia started piano lessons, Fjord showed her which keys to play to do twinkle twinkle little star and they played it together. Not only does John have the perfect temperament to set him aside as a gifted teacher but he is also highly qualified. He has teaching and performing licentiates through Trinity College of Music, London. He has a Bachelor of Music from UNISA where he obtained distinction in Harmony and Counterpoint. He also has a Higher Education Diploma (Post Graduate) through UNISA and was awarded certificates for “outstanding instrumental teaching” through UNISA. If you are looking to attend music lessons in Boksburg you can contact John Skinner on 011 9176703 or 072 7615180. His e-mail address is john.skinner0310@gmail.com He teaches, piano, violin, viola, cello, harp and pretty much any instrument except guitar. Sules I go to a lovely charity shop and I have seen music books there before, when I go again if they still have would you like me to get for you! My daughter also went to John for piano lessons, and I totally agree, he is an amazing teacher, and an amazing person.